The SureFeed Microchip Pet Feeder from Sure Petcare makes sure every one of your pet gets the food it needs, without anyone else eating it all. This innovative, beautifully made feeder recognises your pet's microchip or the SureFlap RFID collar tag (1 included) and it only opens for authorised numbers. It is the perfect solution for multi pet households where it can be tricky to ensure all your pets get their fair share. And if one of your pets needs a special diet or medication it's a great way to restrict acceΒ to food. It is also a great way to stop the dog eating the cat's food! It is simple to scan your pet's microchip into the SureFeed Microchip Pet Feeder from Sure Petcare. Once the number has been learnt it is stored. You can store up to 32 individual microchip numbers. The lid will only open for microchip numbers it recognises. When your pet has finished and moves away from the feeder the lid closes. You can adjust how quickly the lid closes. The bowls are designed to work specifically with this feeder. They have an integrated seal around the top which helps to keep food fresher for longer. Take time to teach your pet how to use the feeder. Let your pet to used to the feeder without the lid and then slowly introduce the lid. 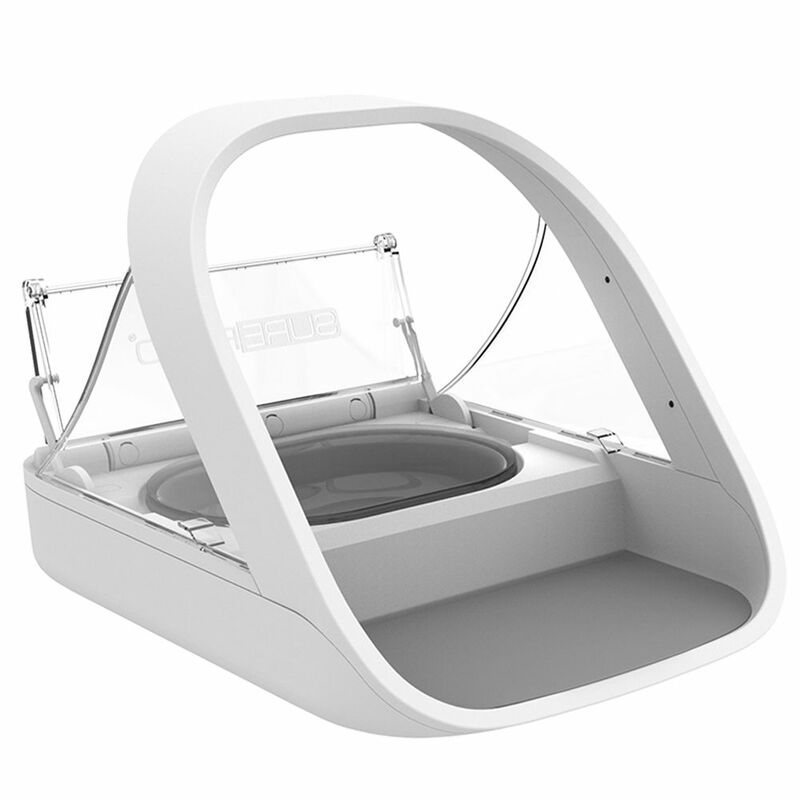 The SureFeed Microchip Pet Feeder at a glance: Microchip activated pet feeder. Ideal for multi pet households Suitable for pets on special diets or medication No stealing food from other bowls: Only opens for programmed microchip numbers Easy to scan numbers in. Only opens for learnt numbers. Shuts automatically: When your pet leaves the sensor area the lid shuts automatically. Lid speed is adjustable Keeps food fresh for longer: Bowls have an integrated seal Keeps smells in and flies out Suitable for up to 32 microchip numbers Training mode: Enables you to get your cat used to the feeder slowly Innovative, top quality Design For use with microchipped pets Can also be used with RFID-collar tags: For pets without microchips Tag has a unique number 1 tag included Collar not included Easy to clean: Bowls and mats can be hand-washed in hot water. The lid has a slider for easy removal. Total dimensions: 310 x 230 x 215 mm (L x W x H) Volume / bowl: 400ml / 105 x 160 x 30 mm (L x W x H) Volume / split bowl: 2 x 200ml / 105 x 160 x 30 mm (L x W x H) Type of food: Dry and wet food Guarantee: 3 years from date of purchase Power: battery operated, 4 x C-batteries – last approx. 6 months Included in delivery: 1 feeder 1 grey bowl 1 grey split-bowl (two sections) 1 grey mat 1 SureFlap RFID-collar tag Important: Batteries are not included in delivery. To complement the SureFeed Microchip Pet Feeder from Sure Petcare, you may also be interested in our handy set of two replacement bowls and a feeding mat in attractive green. The SureFeed Replacement Bowls and Mat - Green at a glance: Vibrant green replacement mat and bowls Set contains: 1 green bowl suitable for use with the SureFeed Microchip Pet Feeder 1 green split-bowl (two..